Kosovo claimed their first win away from home to edge closer to winning the group as two defensive blunders paved the way for a most comfortable 5-0 win over Malta in a match from Group D3 of the UEFA Nations League at the National Stadium on Saturday. Following the draw in Baku, much more was expected from the locals but two goals which could have easily been avoided gave the visitors a two-goal cushion. Kosovo showed no mercy, adding another three goals in the final twelve minutes. This was the biggest home defeat for Malta since the 0-7 defeat to Sweden in 2004. Malta will host the Faroe Islands on Tuesday and still stands a chance to avoid the bottom place with a win. The Faroe Islands, who lost 2-0 to Azerbaijan in Baku in another match on Saturday, lie two points ahead of Malta. Malta coach Ray Farrugia named the returning Zach Muscat, Jonathan Caruana and Luke Gambin in the starting line-up. Muscat and Caruana replaced the suspended Andrei Agius and Steve Borg while Gambin and Roderick Briffa – who was making his hundredth appearance for the national team – were preferred to Paul Fenech and Alfred Effiong. Hogg started in goal with Camilleri, Caruana and Zach Muscat at the back, Mbong and Zerafa on the flanks, Rowen Muscat and Briffa in midfield with Corbalan and Gambin supporting Schembri in attack. Substitute Alfred Effiong received a yellow card, which was his second in the competition, and will therefore miss Tuesday’s clash with the Faroe Islands. Kosovo threatened on the 3rd minute with a Vedat Muriqi header following a cross from the right by Milot Rahica. On the 16th minute, Kosovo took the lead when off a short back pass by Mbong, the ball reached Rashica despite Ryan Camilleri’s tackle with the ball reaching Vedat Muriqi who controlled before hitting low past Hogg. Kosovo maintained the pressure and on the 35th minute, Zeneli released Vojvoda on the right and off the latter’s cross, Berisha hit high. Three minutes later, a Roderick Briffa freekick was deflected into a corner. 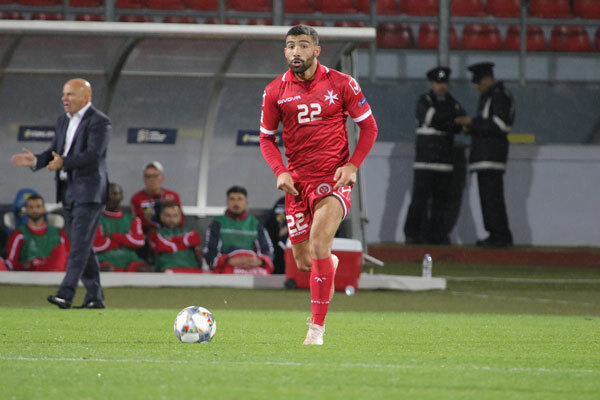 Three minutes in the second half, goalkeeper Samir Ujkani received a back-pass and tried to dribble Andre Schembri, almost losing possession. Zach Muscat then had a header from close range blocked by a defender into a corner following a cross from the left by Roderick Briffa on the 58th minute. At this point, Ray Farrugia opted to replace Corbalan and Rowen Muscat with two strikers – Michael Mifsud and Alfred Effiong. The visitors doubled the score on the 70th minute thanks to a soft goal as Zach Muscat and Ryan Camilleri collided just outside the area, leaving Benjamin Kololli all alone in front of Hogg and placed the ball at the back of the net with a perfect lob. Kosovo made it 3-0 on the 78th minute when off a swift counter-attack, Muriqi crossed from the right and substitute Donis Avdijaj hit home from close range. Two minutes later, the visitors increased the lead with Donis Avdijaj once again hitting from close range, this time off a cross by Rashica. Luke Gambin had a powerful shot from the edge of the area turned into a corner on the 82nd minute. However four minute from time, Kosovo scored the fifth goal thanks to Milot Rashica who concluded a solo effort with a powerful shot from outside the area which hit the upright before ending at the back of the net. 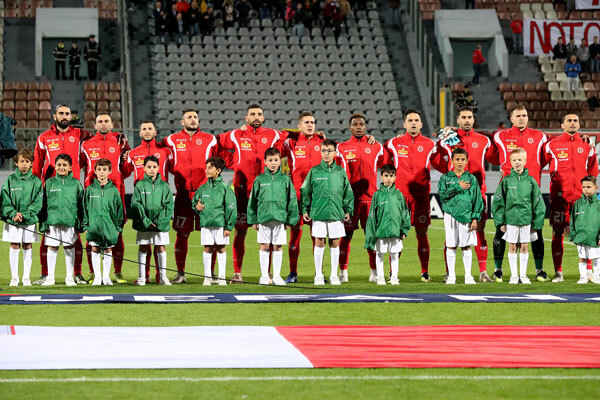 MALTA Andrew Hogg, Jonathan Caruana, Joseph Zerafa, Joseph Mbong, Luke Gambin, Andre Schembri, Rowen Muscat (64’ Michael Mifsud), Juan Corbalan (65’ Alfred Effiong), Ryan Camilleri, Roderick Briffa (74’ Paul Fenech), Zach Muscat. KOSOVO Samir Ujkani, Fidan Aliti, Herolind Shala, Hekuran Kryeziu, Milot Rashica, Arber Zeneli (71’ Donis Avdijaj), Amir Rrahmani, Valon Berisha (61’ Besar Halimi), Mergim Vojvoda, Benjamin Kololli, Vedat Muriqi (83’ Shkelqim Demhasaj). unless local clubs give more play time to local kids we will never see the national team take that step forward. Too many foreign players do not help the cause and unless the clubs together with the MFA and maybe with the help of the government tackle this problem. we will never get out of this pathetic problem.Anyway, most of the foreign players that play in Malta are no name players. That is why the turnover of such players. The government should not give work permiits to players that are of no such class that the local game do not benefit from their output. I agree 100% with you, and don’t forget that the MFA is considering allowing clubs fielding 11 foreigners to make matters worse.My opinion is allowing only 3,and unless this happen I for one will never attend a game.